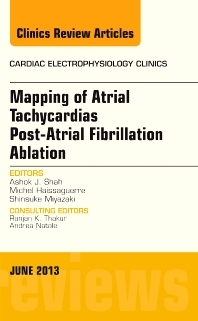 This issue of Cardiac Electrophysiology Clinics covers mapping of atrial tachycardias post-atrial fibrillation ablation. Expert authors review the most current information available about setting up the electrogram display, basic principles of conventional mapping, 3D mapping, and diagnosis of several tachycardias, including pulmonary vein tachycardia, macroreentrant atrial tachycardia, and atrial tachycardia. Keep up-to-the-minute with the latest developments in this rapidly evolving technology.